Democratic governors in seven “red” states, and Republicans in two “blue” ones, will help insulate 81 likely Congressional seats from gerrymandering after 2020. Redistricting for another 61 seats will likely remain entirely in Republican hands compared to just seven seats in states with unified Democratic control. Yesterday’s election helped limit potential gerrymandering after the 2020 Census in a half-dozen states but not, unfortunately, in the largest prizes. Democrats appear to have failed in their bids to win the gubernatorial elections in Florida, Georgia, and Ohio, and in all three states Republicans maintained their control over the state legislatures as well. Barring Democratic legislative victories, all three of those states will remain prospects for Republican gerrymanders in 2021. Democrats did win or retain the governorships in Colorado, Connecticut, Illinois, Maine, Minnesota, Pennsylvania, and Wisconsin and will likely face either Republican or split legislatures when redistricting maps are redrawn after 2020. Together those states will probably encompass 64 Congressional districts after reapportionment. Two states, Maryland and Massachusetts, with a likely total of seventeen seats, will see Republican governors facing off against Democratic legislatures in 2021. I would not be surprised to see a new Republican representative sent to Washington after the 2020 Census from both these states which now have uniformly Democratic Congressional delegations. Because the Democrats failed to win the governors’ races in Florida, Georgia, and Ohio, all three states will be prime targets for Republican gerrymanders in 2021. (Iowa, with its four Members of Congress, matters much less.) Ohio and Florida accounted for three to five “excess” Republican seats after the 2010 Census, and Georgia may have added another. Because the Democrats fared less well in these larger states, the GOP will be drawing district lines for 61 of the 149 seats in “trifecta” states where they control both the governor’s mansion and the two houses of the state legislature. 1Both Michigan and New York appeared in the earlier version of this chart. However both states will be using nonpartisan redistricting commissions in 2021 and have been excluded from the analysis here. Elections this fall may limit the extent of gerrymandering for some 200 House seats after the 2020 Census. In 2010, Republicans took control of many state legislatures and governors’ offices, which offered them the opportunity to draw district maps that favored their party. During 2011-2012 when those maps were drawn, Republicans controlled both the executive and legislative branches in nineteen states and appear to have won fourteen percent more House elections in those states than we might expect based on historical data. Democrats controlled just eight states and won four percent more seats than expected. In thirteen states partisan control was split between the branches, and there the partisanship of the governor appears to have been the controlling factor. In split control settings, the governor’s party won about six percent more House seats after 2010 than expected. The election in November has the potential for influencing how dozens of Congressional district lines will be drawn in the aftermath of the 2020 Census. In a number of states Democrats are poised to break the Republicans’ lock on control of government by taking back the governor’s mansion. I have categorized the governors’ races by their competitiveness using the most recent ratings for those races as compiled at Wikipedia. Since the next redistricting will involve the results of the 2020 Census, I have used state-level population projections to estimate the number of seats each state will be awarded after reapportionment. Most states’ representation in Congress will not change, but a few states like Texas are projected to add seats, while Rhode Island may lose one of its two representatives in the House. Forecasting the results of state legislative races this fall, and more importantly two years hence, is obviously a dicey proposition. I have instead assumed that all legislatures will be controlled by the same parties that control them now. Based on these data I estimate that redistricting for some 188 seats, or 43 percent of the House, may be affected by the results of this year’s gubernatorial elections. An “S” (“split”) code in the legislative column indicates that the two houses of the state legislature are held by different parties. The first two columns of this table present the likely outcome of this fall’s race for governor in each of these states. 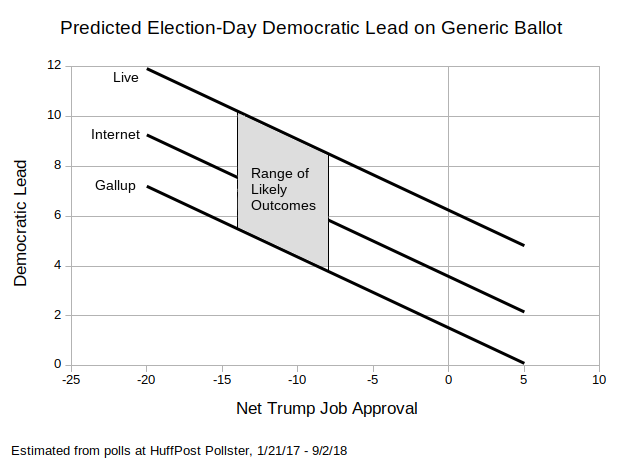 The “Consensus Rating” is based on translating each prognosticator’s ratings like “Safe Republican” or “Likely Democrat” into a numerical score and averaging them. I also present the most recent ratings for each race from the well-known site, FiveThirtyEight.com. In these more competitive states Democratic candidates for governor appear to be well-positioned to win back these offices from the Republicans. 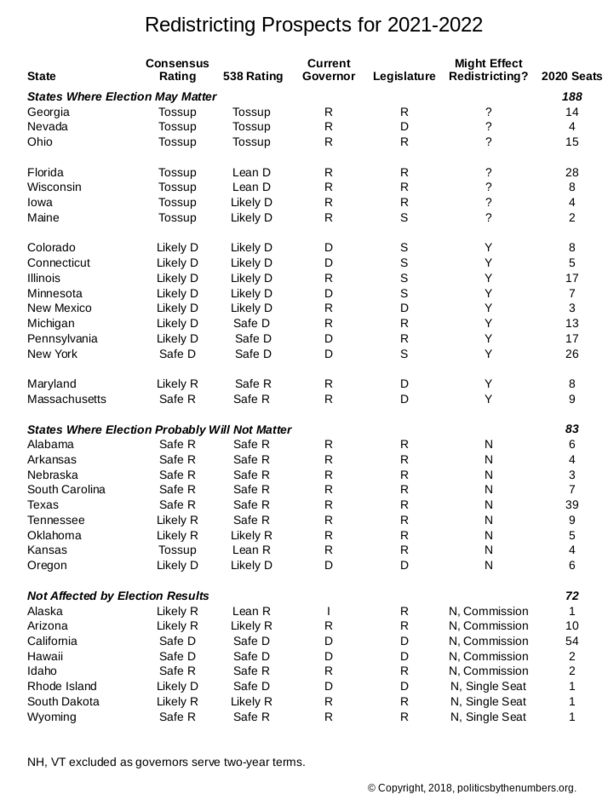 Only in Massachusetts and Maryland are we likely to see Republican governors winning re-election while their states’ legislatures remain in Democratic hands. In ten states from Georgia to Michigan to New Mexico, Democratic candidates are poised to oust Republican governors even if their states’ legislatures do not change hands. 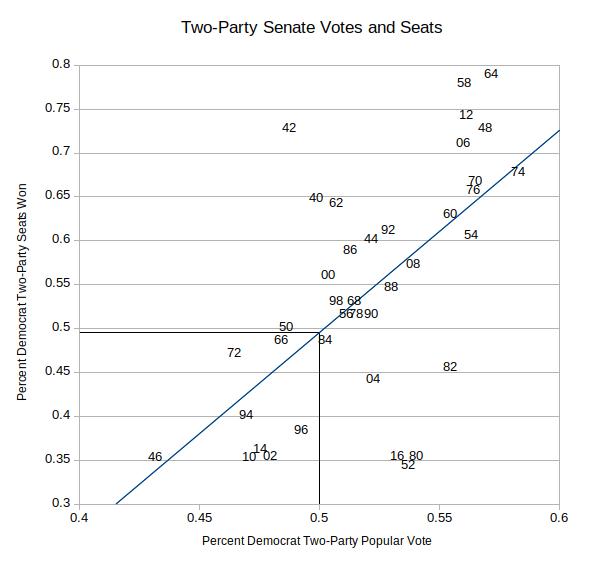 As my results from the post-2010 redistricting showed, governors appear to have most of the clout in redistricting battles, reducing the chances of gerrymandering in places like Michigan, Ohio and Florida, all of which had an “excess” number of Republican seats beginning with the 2012 election. 1Governors in New Hampshire and Vermont serve two-year terms. In “split-control” states, Republicans won 6.2 percent more seats than expected when they held the governorship; when Democrats held that office, Republicans won 6.5 percent fewer seats than expected. Americans will elect thirty-four governors to four-year terms this fall. They will still be in office after the 2020 Census and will have a say in how states redraw their Congressional and legislative district plans. All states where legislatures draw district lines except North Carolina grant the governor the power to veto any plan. In states where control over the branches is split between the parties, this process should lead to compromises acceptable to both parties. As well see, however, the evidence from the redistricting after the 2010 Census suggests governors hold all the cards. In nine states, politicians play no direct role as redistricting is left up to nonpartisan commissions. Courts, too, can override the lines drawn by legislatures. This year’s dramatic redrawing of the lines in Pennsylvania follows similar judicial interventions in Florida and New York. The New York decision affects my analysis since it applied to elections beginning with 2012. (The other decisions have yet to come into force.) I have added New York to the commission list, but have analyzed it, and California, separately as well. maps drawn when either the houses of the legislature were held by opposing parties, or where the legislature had unified control but faced a governor of the opposite party (13 states). 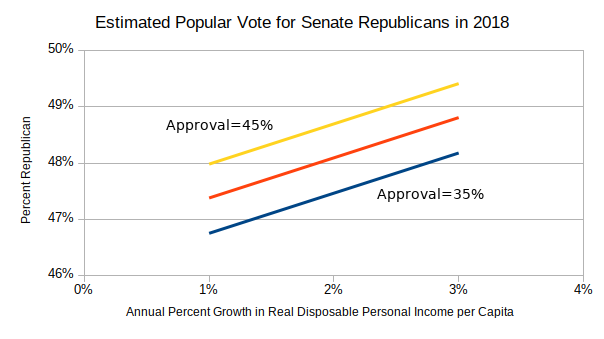 The first column reports the Republican percent of the total two-party popular vote summed across the three elections, 2012, 2014, and 2016. In the sixteen states where Republicans held both houses of the state legislature and the governorship, they won 56.5 percent of the two-party House vote and 71.7 percent of the seats. In solidly Democratic states the Republicans won both a minority of the popular vote and of the seats awarded. The results for commissions and courts is complex; I will deal with it in a later article. In various articles here I have described the natural inflation of the proportion of seats won due to the operation of our first-past-the-post electoral system. As parties win larger and larger proportions of the vote, they gain an ever-increasing share of seats. I have estimated this inflation factor using both biennial election results back to 1946, and across states in 2012. Both methods produce equivalent results, for instance. 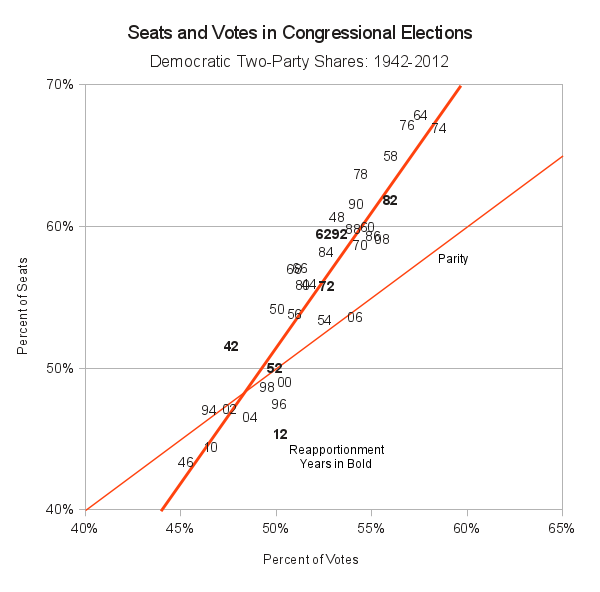 To estimate the share of seats awarded you need only square1 the value of the ratio (Republican Votes)/(Democratic Votes) to get the ratio (Predicted Republican Seats)/(Predicted Democratic Seats). 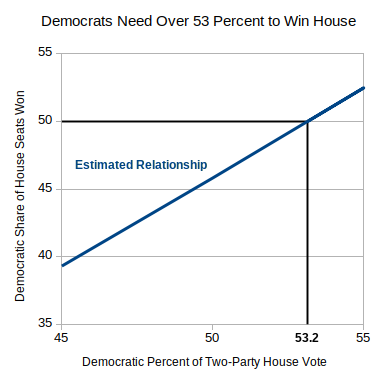 This approach gives rise to the third column in the table, the proportion of seats that are predicted to be won by the Republicans after applying this “square law” rule.2 In the entry for Republican control, that party’s 56 percent share of the House vote should produce a share of about 63 percent of seats. In practice, the Republicans won nearly 72 percent of the seats. The final column measures the over- or under-representation of the Republicans in the House as a percentage gain or loss compared to the predicted share. In this case, the Republican’s 72 percent is about 14 percent higher than the expected 63 percent. This figure provides a criterion for evaluating how over- or under-advantaged a party was compared to expectations. The normal expectations for states with unified control are confirmed: Republicans win a disproportionate share of seats in states where they controlled the redistricting process, and won disproportionately fewer seats than expected in states where the Democrats were in control. Notice that the size of Republican advantage in states that party controlled is larger than the disadvantage the Republicans faced in states controlled by Democrats, +14 percent versus -4 percent. 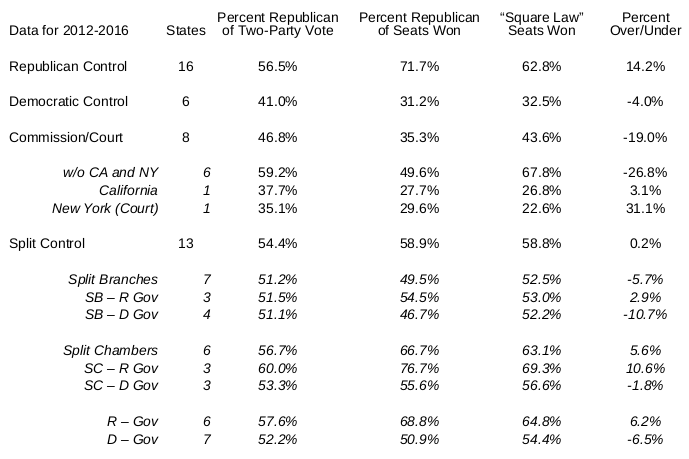 By this measure states with some form of split party control show hardly any partisan advantage at all. Republicans won a share of the seats awarded in these states nearly equal to their expected share. However, it turns out this overall result hides a lot of significant variation. ones where the chambers of the state legislature are held by different parties. As it turns out there are nearly equal number of each type of split control; in seven states unified legislatures faced an opposition governor, while in six states the chambers themselves were split. Once we break out these various patterns, the power of governors becomes clear. 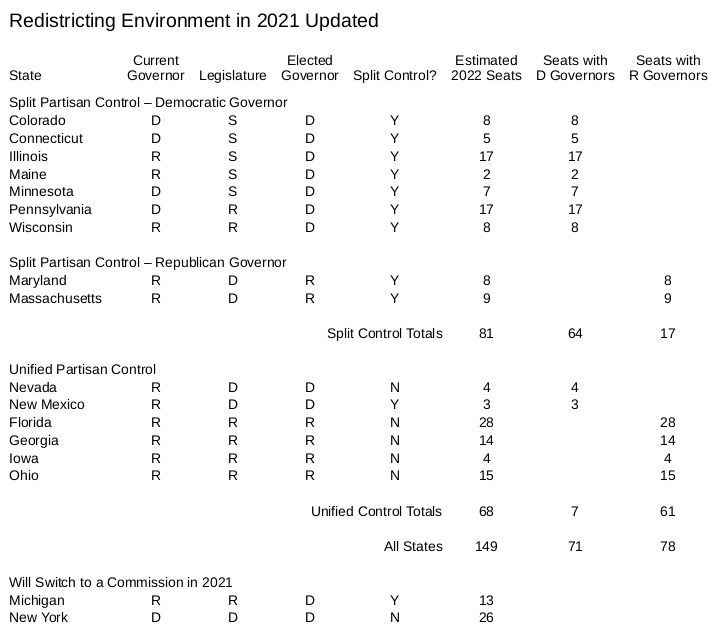 In both types of split control, the governor’s party is disproportionately advantaged during redistricting. In fact, if we group these split-control states together simply by the partisanship of the governor, Republicans were over-represented in seats awarded by 6.2 percent where they held the governorship; when Democrats held that office, Republicans were under-represented by 6.5 percent. These results are rather striking. They suggest that opposite-party governors can force a redistricting map that is actually more favorable to the governor’s party than to the legislature’s. Similarly when the two legislative chambers are held by opposite parties, it is again the governor who appears to determine which map wins approval. It appears the governor’s veto is a more powerful weapon in the fight over Congressional district lines than the legislature’s control over drawing the lines themselves. This fact could weigh heavily over redistricting fights in states like Colorado, Michigan, Florida and Georgia where Democratic governors may win election and end up facing Republican legislatures. In Massachusetts and Maryland the reverse will likely hold true. 1The longitudinal estimate was 2.04; the cross-sectional estimate was 2.08. For simplicity I have rounded down to two, which is well within the confidence intervals for each estimate of beta. 2The tendency for first-past-the-post systems to disproportionately advantage the winning party was first observed in elections in the United Kingdom. There the coefficient reached three, giving rise to the name “cube law” rule, since cubing the ratio (Labour Votes)/(Conservative Votes) does a good job of predicting the ratio (Labour Seats/Conservative Seats). Following this tradition, I have named the US version of this relationship the “square law” rule. 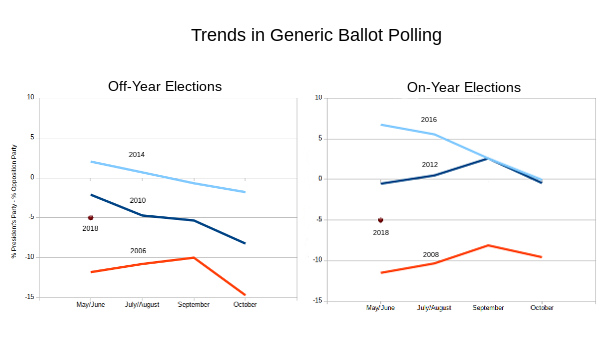 How Well Do Generic-Ballot Polls Predict House Elections? 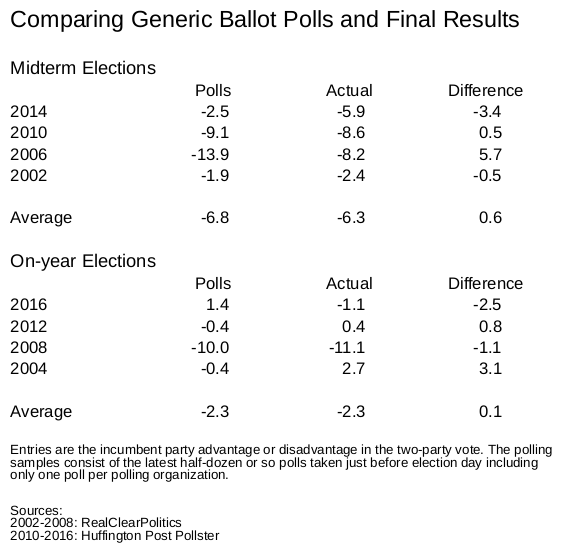 I have compiled the results of generic-ballot polls taken near to an election and compared them to the actual division of the Congressional vote. The table below presents the margin between support for the President’s party and support for the opposition. For each election I have used about half-a-dozen polls from different agencies taken just before voting day. 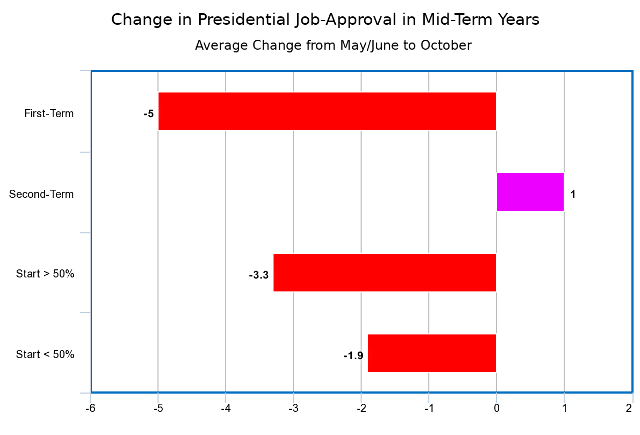 Averaging the differences between these two quantities shows that these polls have fared rather well since 2002. The average deviation in the four midterm elections is 0.6 percent; in Presidential years that falls to 0.1 percent. Still these averages hide some fairly wide fluctuations. In four of the eight elections the difference between the polls and the election results exceeds two percent. 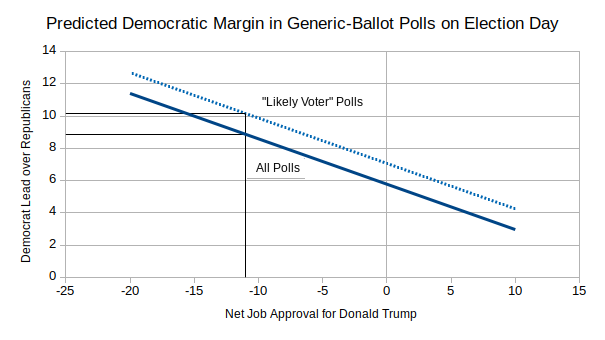 The error was especially egregious in 2006 when the polls predicted nearly a fourteen-point Democratic margin compared to 8.6 percent in the election itself. 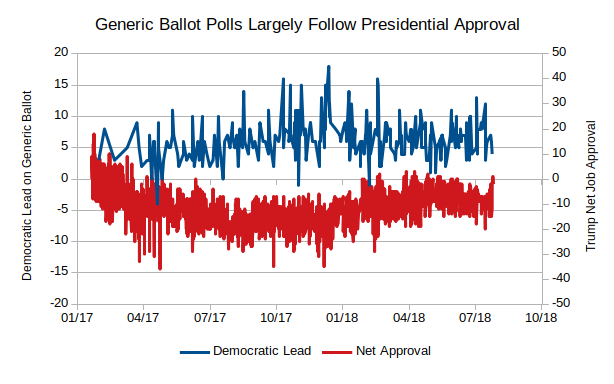 In the most recent election, 2016, the polls predicted a slight positive swing in favor of the Democrats, but the outcome went slightly in the opposite direction. All the cases where the polls erred in picking the winner occurred in Presidential years and usually when the polling margin was close. The four polls taken during midterm years all predicted the correct winner, though the size of the victory was off by more than three points in two of those elections. Some 1,500 children remain separated from their parents and in government custody. Only 63 percent of children whose cases have been officially been reviewed have been reunited with their parents. The Federal Government has provided new figures concerning the migrant children separated from their parents at the border as part of the proceeding before Judge Dana Sabraw. I have used these figures, along with my previous accounting, to develop estimates of the number of children reunited with their parents, and those not yet reunited for a variety of reasons. 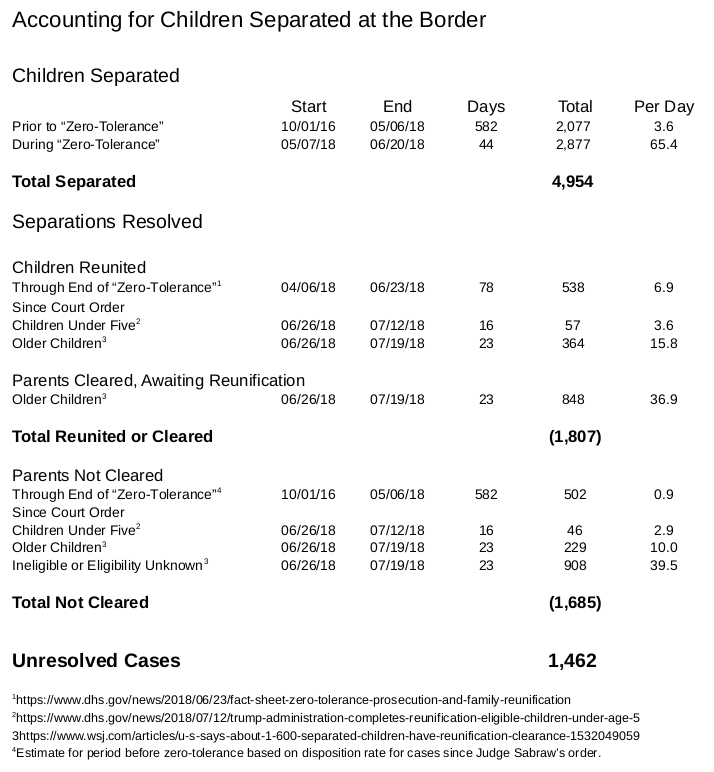 I start with the total of 4,954 separated children I estimated earlier including both children separated during the “zero-tolerance” period and those separated during the “pilot program.” There are three official sources of information on reunifications. The first is a “fact sheet” from DHS which reported that 538 children had been reunited with their parents “as part of the Zero Tolerance initiative.” Some number of these children may have been separated before zero tolerance, but we have no way of knowing how many. The “Fact Sheet” also fails to mention the number of children whose cases were processed but who remain in government custody. I will estimate that number below. The other two sources of data on reunifications comes from the filings made by the government in the case of Ms. L.v. ICE before Judge Dana Sabraw. On June 26th Judge Sabraw ordered that the government must reunite all separated children. The government has since submitted two filings to the court reporting on its progress. The first, filed July 12th, concerned the disposition of the supposed 103 children in custody who were under five years of age. (This figure of 103 remains suspiciously low.) Late this past Thursday, July 19th, the government reported on its progress with the older children in its custody. The government could only identify and clear the parents of 57 of the youngest children. The other 46 remain in government custody because it determined the child might be subject to abuse, the parents were in custody or had criminal records, the associated adult was not the child’s parent, or, in twelve cases, the parent(s) had already been deported. The clearance rate was higher for the older children. 364 of them were reported to be reunited with parents, and in another 848 cases the parent(s) were identified and cleared, but the reunification had yet to take place. However the government also identified another 908 children whose parent(s) were either declared ineligible or whose eligibility was still unresolved. The one remaining piece of the puzzle concerns the number of children separated before zero tolerance began who were subsequently reunited with their parent(s). If we assume that their cases were disposed of at the same rate as cases during zero-tolerance, we can estimate the number of reunited children from that earlier period. Combining together the 57 reunited young children with their 364 older reunited peers, and counting the 848 children awaiting reunification, gives us a total of 1,269 children either reunited or awaiting reunification. In comparison 46 young children and 229 older ones remain separated because their parents were not cleared. 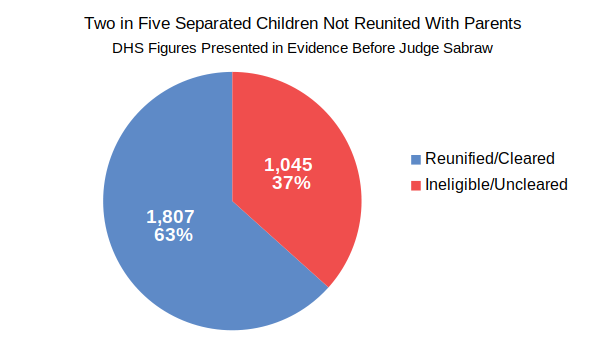 If we add to that the 908 children who may also be ineligible, we get a total of 1,183 children whose cases have been reviewed without reunification, Applying the same “clearance rate” to the period before zero tolerance gives us an estimate of 502 children from that period who remain ineligible for reunification. The rate at which parents are declared ineligible should be a major source of concern. Of the 3,492 separated children whose cases I estimate were resolved by July 19th, only 1,807, or just 52 percent, were reunited or awaiting reunification with their parents. 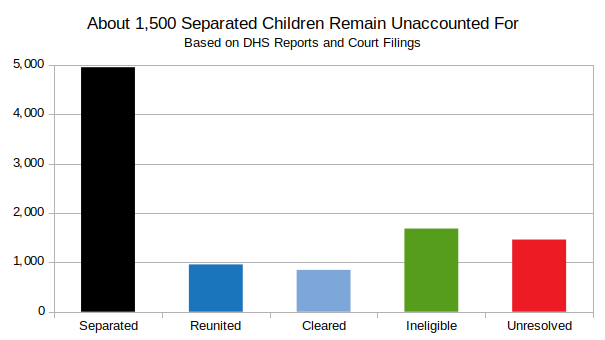 If we rely solely on official reports, 1,045 children were ineligible or uncleared. Even that more conservative figure results in a reunification rate of just 63 percent. How the number of separated children grew to nearly 4,300, and why many more than 103 of them must be under five years of age. In the last post I offered a simple bookkeeping model using reported figures from DHS and plausible extrapolations to estimate the number of children separated from their parents at the border since October, 2016. Here is the time track of the number of children in custody. The solid lines connect points based on DHS reports; the dotted lines are estimates. Much attention has been paid to the 103 children under five who were supposed to be reunited with their parents last week. A rate of 103 children under five from a population of “fewer than 3,000” separated children is entirely preposterous. About one in three children living in the countries from which most families migrate is under five years of age. There must be hundreds more “tender-aged” children in custody than the government has accounted for so far. How Many Separated Children are in Custody? The Department of Homeland Security’s own reports indicate that nearly 5,000 children have been separated at the border. Some 4,300 remain in custody, many more than the current official figure of “fewer than 3,000.” Also there must be many more than 102 children under five years of age. Since the introduction of the policy of “zero-tolerance” on our southern border, the Department of Homeland Security (DHS) has released a set of inconsistent reports about the number of children taken into custody and the number reunited with family members. Now that a Federal judge has ordered that all the separated children be reunited expeditiously, the Department of Health and Human Services, in whose custody parent-less child immigrants are placed, now states that the number in their care is “fewer than 3,000.” That figure is not consistent with the existing reports from DHS. We have one good estimate of the number of children taken prior to zero-tolerance. On June 29th DHS told NBC News that a “pilot program” had already separated 1,768 children through February, 2018, a figure which had probably grown to 2,000 by the time zero-tolerance took effect on May 7th. 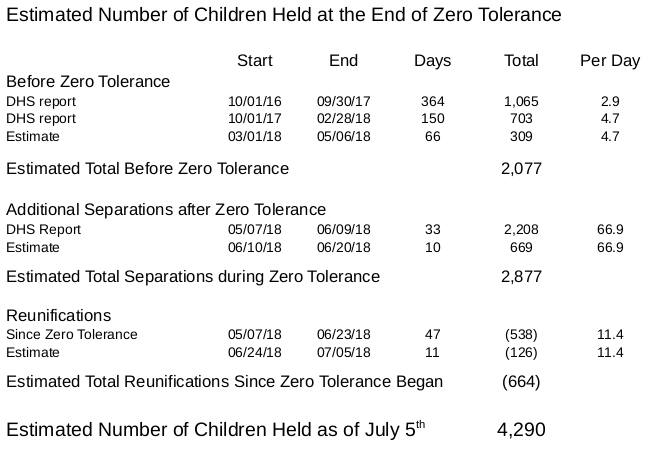 Also the last DHS report on the number of separated children ends on June 9th, eleven days before the President’s ordered an official end to separating families. Extending the DHS figures through June 20th adds nearly 700 more children to the total. In the sections below I will review the DHS reports then use them to estimate the total number of separated children. According to the NBC News report, nearly 1,800 children were already in custody by the end of February, 2018, weeks before the Attorney General ordered “zero-tolerance” for all migrants. Separations were fairly rare in this period though, averaging fewer than five per day between last October and February of this year. DHS issued two overlapping reports after the imposition of zero-tolerance. One covered the period from April 19th until May 31st; the other covered May 5th through June 9th. Even this second report did not include the entire period of zero-tolerance which lasted until President Trump’s order on June 20th. As an example of the calculations involved, take the number of children before zero tolerance began. Official DHS figures cover the period from October, 2016, through February, 2018. That leaves some 66 days between the end of that report and the onset of zero tolerance on May 7th. 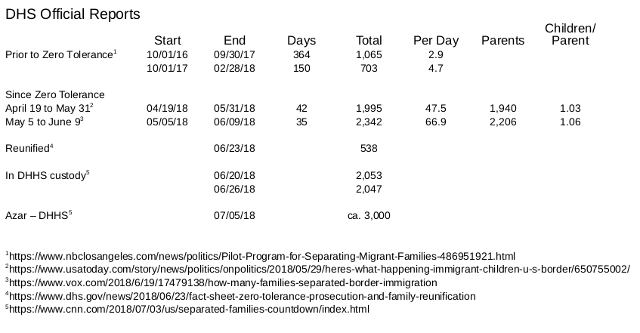 I use the estimate of 4.7 separations per day from the second DHS report to estimate that another 309 children were separated from their parents during those 66 days. The same method is used to generate the other figures marked “Estimate” in the table above. Note that using the 4.7 per-day rate is probably a conservative estimate of the rate of separations between March 1st and May 5th. These estimated figures appear as dotted lines in the chart above. On June 23, DHS reported that 538 children had been reunited with their parents “as part of the Zero Tolerance initiative.” I have attributed all those children to the zero-tolerance period. (There is no data on the number of reunited children taken before zero-tolerance began. I return to that issue below.) 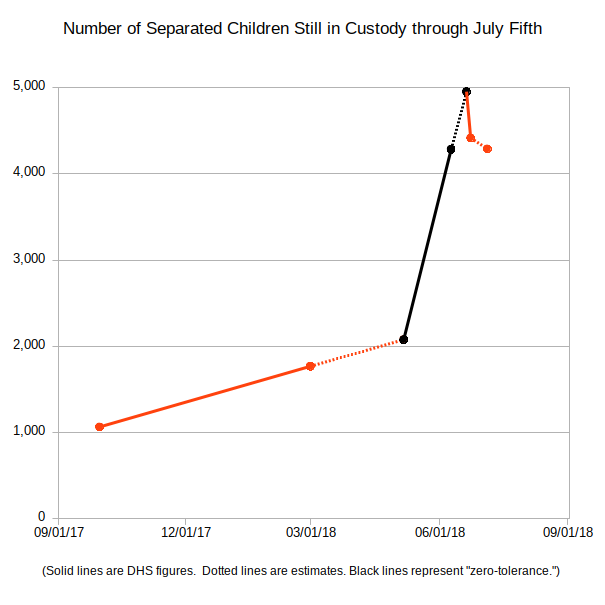 If we assume that reunifications continued at the same pace through July 5th, another 126 children would have been returned to their parents between June 23rd and July 5th, raising the estimated total to 664. I have not found figures for reunifications prior to zero-tolerance. Some of the 2,077 children taken before May 7th may have been reunited with their parents. But even if we assume as many as a quarter of them were placed back in their parents’ arms, that would still leave the total number of children separated from their parents closer to 4,000 than to Azar’s 3,000. 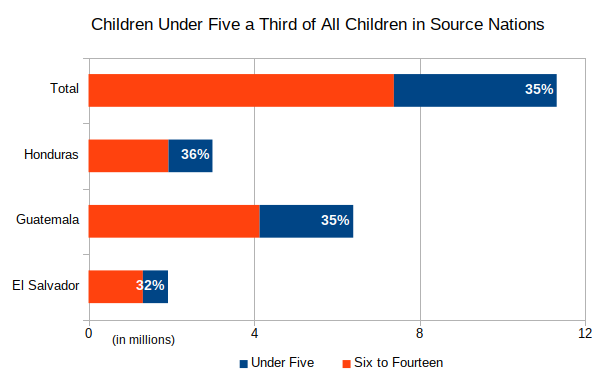 How many children are under five years of age? The court order mandated that children under the age of five had to be reunited with their parents fourteen days after the order went into effect, or July 10, 2018; for older children the deadline was thirty days (July 26). Azar told reporters in the telephone call-in that only about 100 of the children in DHHS custody, or about three percent, were under five. This past weekend, under order from Judge Sabraw, the government turned over to the ACLU a list of 102 children that purportedly included all those under five in the government’s custody. This figure is implausibly low. First, even if the proportion of young children was only three percent, my estimate of 4,290 total separations implies that the total number of young children should be closer to 143. However the three percent figure itself is highly suspect given the age distribution of children living in the three countries from which most asylum-seekers emigrate — El Salvador, Guatemala, and Honduras. The bottom four bars of each graph depict the numbers of boys and girls in four age groups, 0-4, 5-9, 10-14, and 15-19. In both Guatemala and Honduras about a quarter of all children and teens are under the age of five. 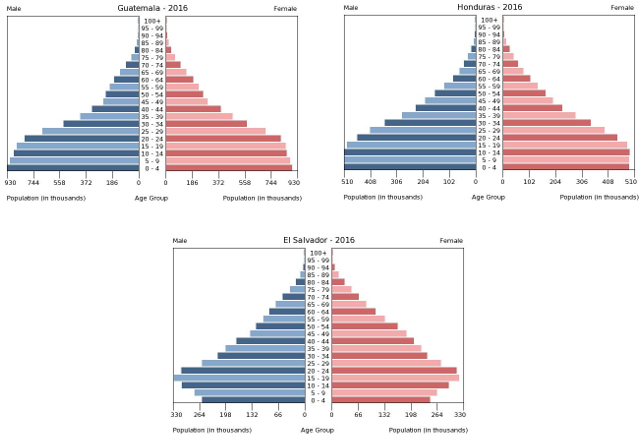 For El Salvador, whose birth rate has slowed in comparison to the other two countries, young children constitute a somewhat smaller share. Now we can certainly imagine that worried parents might be reluctant to carry a two-year-old child across hundreds of dangerous miles to seek refuge in the United States. That would imply that the age distribution of the separated children skews somewhat older than the source populations from which they are drawn. Even with such an older skew though, Secretary Azar’s figure of just three percent remains highly dubious. If the proportion of separated young children were just ten percent, or half or less of the actual proportion of very young children living in these countries, there should be over four hundred children subject to the July 10th deadline, not 102. One other feature of the DHS reports also bears mentioning. Notice in the first chart that the numbers of separated children and parents are nearly equal. That ratio is consistent with either single parents carrying a single child, or couples with two children. It is unlikely that most of these are single-parent families given the high proportion of Catholics in the source countries and the consequent low divorce rates like those reported for Guatemala. Some of these parents might have left their spouses behind to look after other children or have come to be reunited with a spouse already in the United States. Are Some Republicans Leaving Donald Trump? 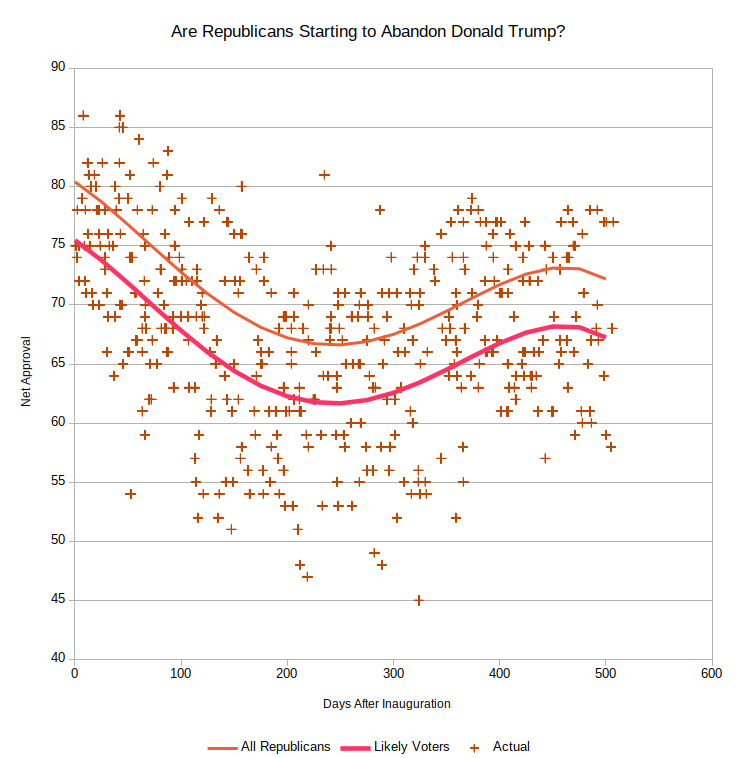 Recent polling suggests Trump has been losing support among Republican voters since the spring. Likely Republican voters show less support than other Republicans. It has become a commonplace among journalists and pundits to observe that Republican voters have remained largely behind President Trump. Recent polling still shows job-approval ratings for the President among Republicans remaining in the 85 percent range. But that focus on individual polls obscures a more complex trend, one that does not bode well for President Trump and his Republican Party. 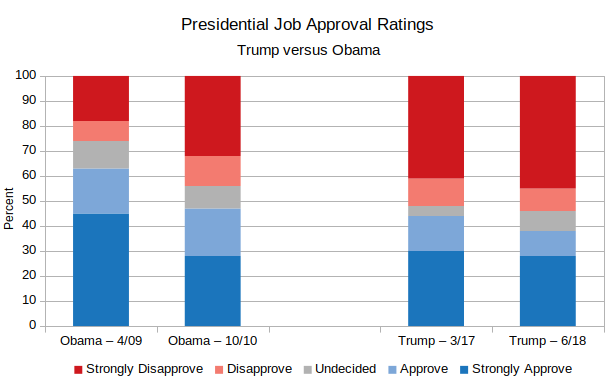 The bold line representing the President’s approval rating among likely Republican voters should be especially troubling. The Republicans most likely to turn out in November average about five points lower on net job approval than do other Republicans. 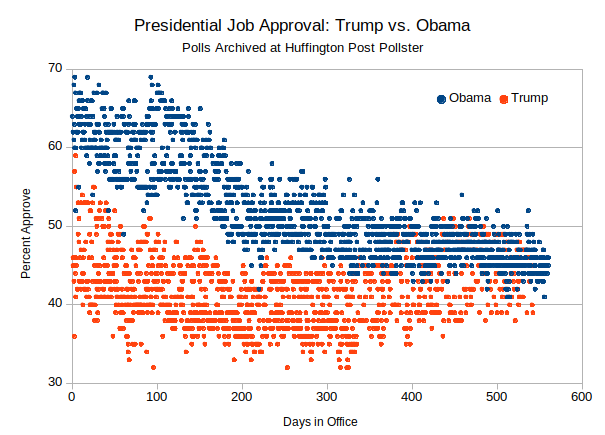 Even casual examination of the data points displayed here show that Republicans’ opinions about Trump’s performance in office have displayed wide variability since he entered the Oval Office. 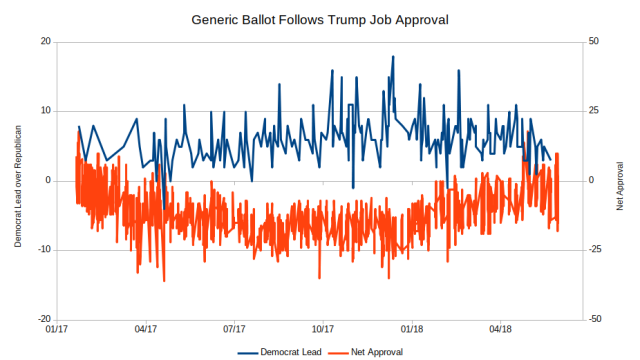 However the most recent polling shows a decline in approval since the spring of 2018.